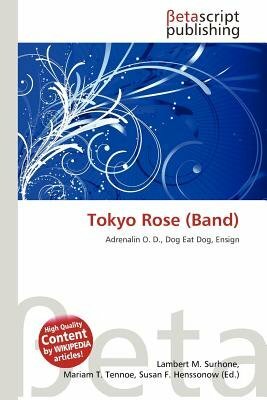 High Quality Content by WIKIPEDIA articles Tokyo Rose is an indie rock band from New Brunswick, New Jersey. As of 2007 they have released 3 studio albums, and a short demo EP, whilst extensively changing their lineup over their 7 years of activity.Tokyo Rose was formed in 1999 by Mike Glita, former bassist of Senses Fail, and Matt Reilly, formerly of The Finals. Soon after going through several line up changes, Ryan Dominguez became the new singer/frontman of the band. This marked the fruition of what eventually became what Tokyo Rose is today. In the summer of 2001, Reilly parted ways with the band, while Glita, the drummer of Tokyo Rose at the time, and Ryan Dominguez (vocals, guitar) enlisted Chris Poulsen (bass), formerly of Professor Plum, and headed into the studio to record their debut EP "Chasing Fireflies." The EP was released on a label based out of Boston called All About Records, and later received distribution through The Militia Group. Later in 2002, Mike Glita parted ways with the band. After a couple of lineup changes, they secured Jake Margolis (drums) and Greg Doran (guitar) to complete the band.